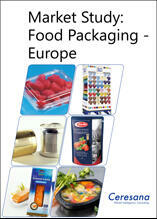 The present study examines the European market (including Russia and Turkey) for food packaging. The analysis includes packaging made of plastics, paper and cardboard (including corrugated board), metal and glass. The market study is presented not only in written form, but it is also illustrated by graphs and more than 230 tables. The demand for food packaging will be analyzed in detail for 12 applications (Bakery and Pastry, Ready-Made Meals, Fresh Fruits and Vegetables, Chilled and Frozen Food, etc.) and 16 packaging types (films, bags, caps and closures, cans, etc.). The market for plastic food packaging for the 8 countries with the largest sales volume will be divided into individual types of plastic (polyethylene, polypropylene, PET, and others). All market data is provided in tonnes. The study also considers secondary and transport packaging which is used as outer packaging and for transporting food. Analysts at Ceresana expect the overall European market for food packaging, i.e. all materials, packaging types and applications together, to reach a market volume of about 38.2 million tonnes in 2022. In this study, beverages are not counted among food and not considered accordingly. However, Ceresana offers individual market studies on bottles, containers as well as caps and closures. The market for food packaging is determined by a large variety of trends. Materials are replaced by others, for example metal by plastics. In the segment Plastics, individual types of plastics are gaining in importance at the expense of others. Composite films made of several layers of different materials are utilized more and more often to meet complex requirements. At the same time, new and innovative packaging types and technologies are developed, such as stand-up pouches, modified atmosphere packaging, intelligent packaging, high barrier film, shelf-ready packaging, etc. Dynamics in individual applications vary depending on the sector and country and are influenced by regulations, legislation and consumer trends. The consumer behavior and expectations are changing due to new technologies, an improved access to information in general, social trends (demographic change, urbanization, orientation towards wellness and convenience, etc.) as well as new distribution channels. All this is having an impact on the way of packaging food today and in the future. Manufacturers are confronted with having to find a way of meeting all these requirements and developing packaging solutions that are lighter, more cost-efficient and of a higher performance as well as innovative, attractive and practical. The market for bioplastics is rapidly growing. Packaging solutions, especially single-use food packaging, will have a great potential for the usage of bioplastics. In Europe, the demand for bioplastics in the packaging industry is expected to increase by more than 15% p.a. over the next years. As the term sustainability is clearly gaining in importance for evermore consumers, the demand volume of packaging solutions that are considered to be environmentally friendly will experience strong growth rates. This also includes packaging solutions made of recycled plastics. To some degree, paper packaging can profit from this trend as well. The preference for organic food is rising and thus stimulating the usage and sale of packaging that is perceived to be sustainable. However, sustainability alone is not enough. Glass packaging, for example, is considered to be sustainable, but its European demand will fall by more than 1% p.a. over the next years. Consumers often find that container glass is too heavy and impractical as there is a risk of breakage. Consumers expect lightweight and practical packaging, a long shelf life, complete information about the packaged product and an appealing design. The industry is steadily launching new products and technologies and is on the right track to meet the requirements laid down by consumers. Stand-up pouches are used in more and more areas in order to reduce the packaging weight and resource deployment. The shelf life of food can be extended by modifying the gas composition inside the package. This method is called modified atmosphere packaging (MAP). Choosing a suitable film with the desired barrier properties is decisive. All in all, consumers are better informed and wish to have as many details about the product as possible, such as the origin, manufacturing conditions, freshness, atmospheric composition inside the packaging, ingredients, additives, etc. By using new and intelligent packaging solutions, consumers gain access to more detailed information about the packaged food. The data can be visualized directly on the packaging (e.g. printed scales) or by scanning codes and information using mobile phones and the corresponding apps. The development of individual food segments is having an influence on the type and demand volume of food packaging. Here, the domestic production volume of the particular food product is playing an important role as many of them are packaged right or shortly after they have been manufactured or harvested. The output in turn is often strongly influenced by domestic demand in the respective country. Therefore, both figures are relevant for the market analysis. Packaging demand for chilled and frozen food as well as for ready-made meals is expected to experience the highest growth rates over the next years. The reason for this is the growing orientation of European consumers towards convenience food. The sales volume of packaging for canned and preserved food, however, is dropping. The dynamic of the packaging market can vary strongly in the individual food segments according to the material and packaging type. Over the next eight years, demand for metal packaging is thus projected to rise by about 0.5% p.a. in the sub-segment ready-made meals while the growth rate for paper and cardboard packaging (including corrugated board) is expected to be at about 3.1% p.a. Paper and cardboard food packaging is generally benefiting from the rising demand for shelf ready packaging. The rising popularity of trading food online will lead to an increased demand for cardboard and corrugated board shipping packaging. Plastic bag packaging is gaining in importance in many segments. In Germany, demand for plastic bags and sacks in the area of food packaging is even experiencing the most dynamic growth rates of 2.6% p.a. when compared to other plastic packaging types. Demand for stand-up pouches is currently showing a very high potential. In the segment Packaging Films (for primary packaging), growth rates are the highest for PET films, especially for BOPET films. Across Europe, we expect an annual increase of, on average, about 3.3% over the forecasting horizon. At the European level, demand for rigid containers will record the highest percentage increase of about 2.0% p.a. in the segment Plastics. Demand for PET containers will even rise by almost 4.0% p.a. This packaging type profits from the rapidly rising demand for food on the go. Chapter 4 provides profiles of the most important manufacturers of food packaging, clearly arranged according to contact details, revenues, profit, product range, production sites, profile summary, products, and applications. Detailed profiles are given for the most important manufacturers including Amcor Ltd., Auxiliar Conservera S.A., Berry Plastics Corporation, Coveris Holding S.A., DS SMITH plc, Karatzis SA, Reynolds Group Holdings Limited, Riwisa AG, Sealed Air Corporation, Smurfit Kappa Group PLC, Sonoco Products Co., Ltd., and Tetra Pak International S.A.